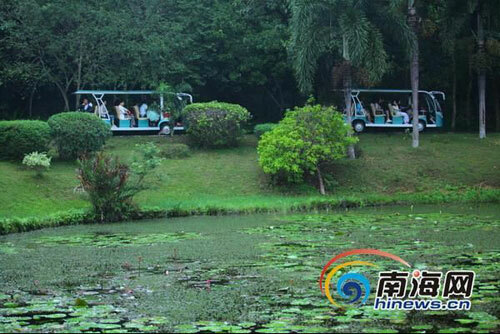 57 internet medias and 67 media representatives from across the country visited the Haikou Volcanic Tourist Site. 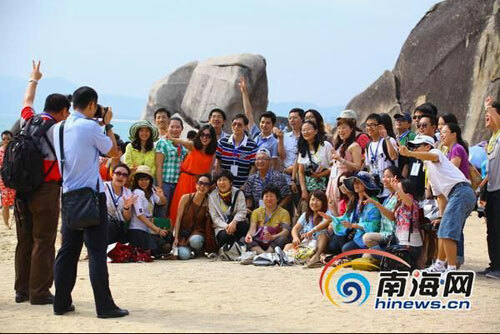 Recently, the large reporting activity of "Pleasure Trip to the International Tourism Island — the 2011 Hainan Trip of the Key Internet Medias in China" which was sponsored by the CCP Hainan Promotion Department and Hainan Tourism Committee and executed by the Hinews.cn of Hainan Daily News Group just finished successfully. During the 27 reporting activities from November 21 to November 27, 57 internet medias and 67 media representatives from China’s portal websites, central and provincial key news websites and some internet medias from Hong Kong and Macao Districts undertook comprehensive reporting across Hainan Island, reported Hainan’s charming tropical seashore and tourism resources, as well as the achievements in constructing the International Tourism Island. 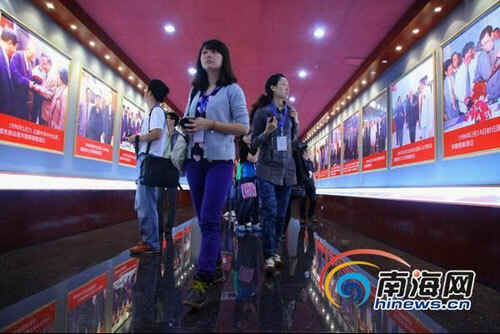 During the 7 days, all the media reports and editors participated in the large reporting activity which started from Hainan’s capital city of Haikou, visited, experienced and covered 11 cities and counties and 38 key tourist sites across Hainan Province, including Chengmai, Danzhou, Changjiang, Dongfang, Sanya, Baoting, Wanning, Tunchang, Qionghai, Wenchang, etc, making professional and concentrated promotion and reports on Hainan’s various representative tourism resources, especially the historical changes after the construction of the International Tourism Island in multiple forms of picture, article, video, microblog, cell phone, etc. 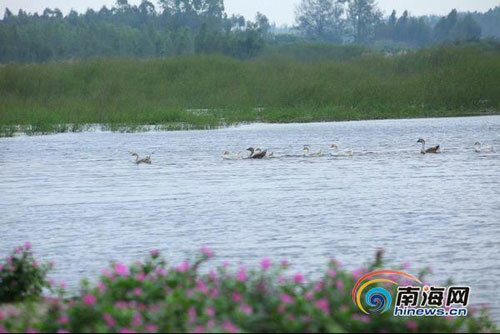 The Changjiang Haiwei Wetland Park has 4,448 mus of area, inhabited 255 kinds of vascular plants, 120 kinds of vertebrates, including 69 kinds of birds. This is a harmonious sight in the Haiwei Wetland Park. 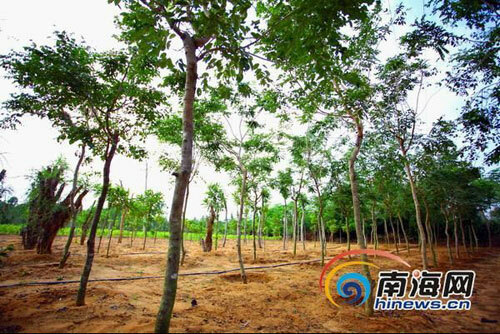 Well growing rose woods at the Dongfang Rare Trees Cultivation Base. The internet media Hainan trip coverage team members are taking group photo in front of the Tianya Haijiao Site in Sanya. The Haikou Volcanic World Geo-park was the first stop of the internet medias Hainan trip, these key internet medias representatives visited the Haikou Volcanic World Geo-park, the Guanlanhu Haikou International Golf Vocation Resort, the Xinbu Island International Yacht Club, the Haikou Bund, the Century Bridge, the Wanlv Garden, the Haikou West Short Belt Park, the Hainan International Exhibition Center, and all marveled at the international spirit of urban construction of Haikou. 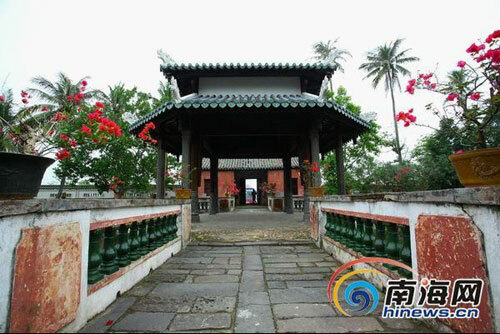 During the visiting of Hainan’s west line, the internet media reporters entered Chengmai’s featured town to taste the Fushan Coffee, and experienced the burning process of ancient Fuan kiln in the Hongkanling Clay Modeling Park; visited the Danzhou Dongpo College and entered the ancient salt pan that has over 1,200 years of salt manufacturing history; visited the Changjiang Haiwei Wetland Park, feeling the wonderful atmosphere of harmonious coexistence between human and nature; and visited the Dongfang Dalbergia Odorifera Root Carving Park, the Dongfang Rare Tree Cultivation Base and the Dongfang Dalbergia Odorifera Wood Carving Handcraft. A small sculpture with ethnic feature in Shijin Village of Sandao Town in Baoting. 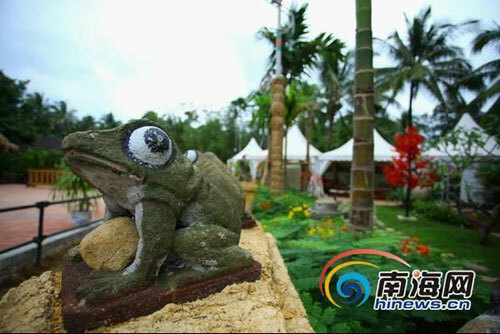 The internet media Hainan trip coverage team members went to the Xinglong Tropical Garden in Wanning City, feeling the magic of nature. During the following part of the pleasure trip, the internet media reporters visited the Sanya Big and Small Rock Caves, the Tianya Haijiao tourist site, and entered the Sanya duty-free shops to enjoy duty-free shopping; went to Baoting to feel the Li and Miao cultures at Binglao Valley and the tropical scenes of Yanuoya, visited the Shijin Village of Sandao Town in Baoting which is the construction pilot of the "Big District and Small Town Plan"; in the Wanning Sun and Moon Bay, they felt the magnificent view of waves hitting the shore, wandered in the Wanning Xinglong Tropical Garden, and praised it as the tropical kingdom; they walked in the Tunchang Oil Painting Street, visited the Tunchang Culture Square and understood Tunchang’s plans of development and construction; entered the Qionghai Memorial Garden of the Red Detachment of Women, listened the legendary stories of the red detachment of women, visited the 102 years old red army soldier, felt the grandness of the Asia’s first talk platform —- the Boao Forum venue; visited the former residence of Song Qingling in Wenchang for a glimpse of the State Mother, and experienced the joy and happiness of bike-ridding at the Red Forest of Bamenwan. According to incomplete statistics, by the noon of November 27, domestic and foreign medias have made 42 special news topics, 5 columns, 1,071 original news reports and published 359 thousand article in domestic and foreign medias. In the microblogs of Tecent and Sina, the number of topical reports and transfers for this activity exceeded 5,400 items. As known, the large reporting activity of "Pleasure Trip to the International Tourism Island —- the 2011 Hainan Trip of the Key Internet Medias in China" created an effect record nationwide for the activity form of "internet media trip", achieved astonishing effect in the promotion of Hainan’s overall tourism resources and the featured tourism in each city and county, its following effect will gradually take place.